To Meg Stuart, borders are irrelevant. Her artistic life began in the USA, today she lives in Berlin and with the location of her company Damaged Gods has a professional focus in Belgium. She works internationally. The borders of the dance world no longer correspond to national demarcations: they are now defined by attentiveness to artistic creativity and the concomitant financial resources. Yet what may sound like cold-hearted calculation can also be a stroke of biographical good fortune. 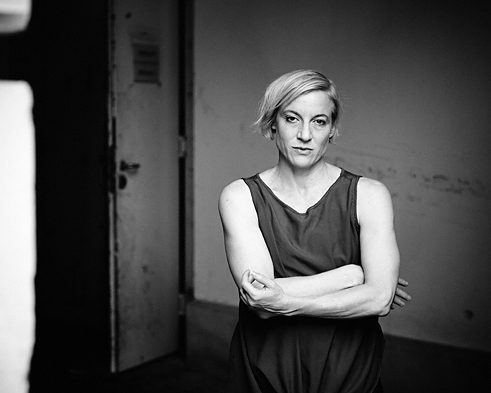 Meg Stuart, born 1965 in New Orleans/USA, had already presented important choreographic works and developed an unmistakeable dance profile by 1991 when she was invited to the epicentre of European contemporary dance, for example to Flanders. It was here that Stuart’s legendary disfigure study was developed as a Klapstuk Festival coproduction. Together with No Longer Readymade which premiered two years later in 1993, it became the icon of a new authorship-related vision of dance and choreography and can definitely be ranked alongside Pina Bausch’s Rite of Spring from 1975. Stuart remained in Europe, based in Brussels where she received funding to expand her company Damaged Goods even after she had become the in-house choreographer of theatres in Zürich, Berlin or later Munich. Nevertheless, her Flemish phase is perhaps the aesthetically most effective of her career, venerated in books and above all in numerous invitations to guest performances and co-productions throughout the world. Stuart is regarded as an American artist as well as Belgian – where her company Damaged Goods is based and financed – and German – for many years now her family has been based in Berlin. With her pieces based on physical exertion and emotional borderline experiences, she has been style-defining in aesthetics as well as in production and working methods. Migration is not actually a term that can be applied to Meg Stuart. For almost all the borders have long since dissolved - like the borders of the empire on the same-scale map as recounted by Jorge Luis Borges.